The Wildlife Trust´s reserve is a 79 year old English fruit orchard standing in about 4 ha (10 acres) of fields and woodland in the centre of Hertfordshire, and about 3 miles east of exit 6 of the AI (M). By train it is 1.6km (1 mile) from Welwyn North Station on the King’s Cross main line, just half an hour or so to the north of London. When you visit the orchard, take time to look around Tewin Viilage, and it´s excellent footpaths and bridleways. If you are interested to know more about volunteering at the Orchard, please contact Paul Thrush at the Hertfordshire and Middlesex Wildlife Trust 01727 858901. The fruit is never sprayed and the poultry, which are kept next to the reserve for their eggs, are free to range. A feature of the orchard is the diversity of different fruits. The apples are picked to be pressed and bottled as a pure apple juice for sale at events arranged to celebrate National Apple Day in Hertfordshire. Check each year for final details. Apple identification is also offered at the Hertfordshire Orchard Initiative Apple Day events, usually held at such places as Codicote, Highfield (in St Albans), Shenley, the Rivers Nursery in Sawbridgeworth, Tring and Hitchin. These celebrations of our national heritage of fruit vary from year to year and for details of the final arrangements it is best to contact this website from July onwards. 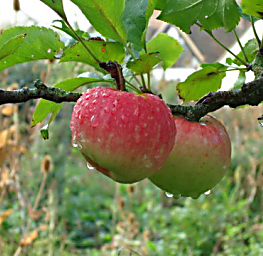 The planting of Hertfordshire varieties of fruit has long been a policy at Tewin and the Hitchin Pippin has been propagated here from the last known named tree which was over one hundred years old. It is featured in Apples - a Field Guide and is the apple pictured on the cover.